This recipe inspired us to make use of our rosemary plant, which stuck it out all winter in our back room flower box and is still going strong at the time of writing. We’ve rewritten it a bit to reflect our own preferences (more garlic, more rosemary) and writing style and include metric equivalencies, where appropriate. It’s not all that hard to make, but it does require a lot of sitting around. Maybe not even as much as described here, but the mystical bread alchemy stuff eludes me beyond a certain point. In the mixer bowl of a stand mixer fitted with the paddle attachment, combine 2 3/4 cups flour and yeast. 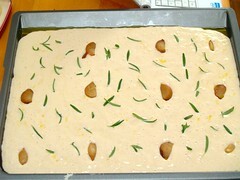 With the mixer running on low, gradually add the water and mix until the dough comes together, about 3 minutes. Increase the speed to medium and beat until dough thickens a bit and is very smooth. Add extra flour a few tablespoons at a time if needed until a bit stiffer but still a very runny dough resembling melted mozzarella. Add sugar and salt and beat until just incorporated. Spray or oil a large stainless steel bowl and scrape the dough into bowl. Lightly spray the top of the dough and cover with a towel. Allow the dough to rest about 2-3 hours in a warm place. It may grow in size, but ours didn’t much, and it was still yummy. Coat a 12×17-inch sheet pan with a heaping tablespoon of olive oil. 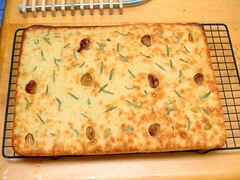 Pour the dough out onto the sheet pan and coat your hands with some of the remaining olive oil. Spread the dough as thinly as possible without tearing it. Let it relax for 10 minutes and continue until the dough fills up most of the pan. Let it sit about another hour to see if it rises. And maybe it won’t at all, but that’s OK too. Preheat oven to 475°F / 246°C. Place the whole cloves of roasted garlic into the dough, and tuck fresh rosemary leaves partway into the dough (to keep them anchored), and then sprinkle the salt, if desired. Place the pan on the lowest shelf in the oven preferably directly on top of a hot pizza stone. Bake 13-16 minutes or until the top is golden brown. Remove from the oven and serve almost immediately. Make sure hot oil doesn’t drip from the pan out onto your besandaled foot and cause your wife alarm as you shriek like a little girl.